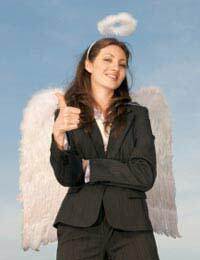 A business angel is an individual who supplies money for a commercial venture. Business angels may also act as a syndicate. When it comes to financial investors, business angels fall between friends and family, and venture capitalists. Friends and family may only be able to supply a limited amount of money for an inventor’s business proposition. Venture capitalists are often more interested in relatively large-scale enterprises. So if inventors have ideas that require more money than they can raise from friends or family, but not so much that they have to go to a venture capitalist, a business angel may be the answer. In the UK, such investors put around £1 billion into new projects each year. Many business angels are interested in pioneering inventions. They know that an innovative concept can catch on quickly in the marketplace and make a substantial return in a short time. And this is exactly what inventors who approach business angels must bear in mind. Business angels are not like banks. They don’t want a single or perhaps low double figure percentage return on their money. What they give inventors are not loans but investments – and the difference is crucial. For investments in inventors’ ideas, business angels may expect a return of at least ten times the original amount they put in. And they want this money within five years. Some business analysts even suggest that in today’s economic climate, because the risk of failure is so great, business angels should aim for a return that’s twenty or thirty times their investment. Inventors shouldn’t let this put them off. If they engage in serious discussions with a business angel, they’ll discover that this return will often come from a move such as the conversion of a private company to a PLC on the stock exchange. Business angels know precisely how they can make a good return. This is why they ask inventors for a substantial interest in the companies that develop and market the ideas. This interest may also come with an exit strategy. In other words, business angels make it clear that after a certain period of time and in the right circumstances, they will sell their interests. By then, of course, the inventors should have successful products. Inventors should also note that some business angels leave them to get on with things. But many offer their skills and experience. Such skills and experience may be exactly what inventors need. The advice and support of a business angel, who is in effect acting as a consultant, can be very valuable. If using a business angel sounds like a viable idea, inventors should do a little research first. This isn’t always easy because many business angels prefer a certain amount of anonymity. One place to start is the British Business Angels Association. This is the only trade organisation for angel investing in the UK. Membership includes 24 business angel networks. Another route to try is the National Business Angels Network (NBAN). NBAN can make introductions between inventors and business angels. It also has the backing of several banks.